Eoin Rheinisch put us all through hell this morning, but proved his class when he finished fourth in the men's K1 slalom - the best ever result by an Irish paddler at the Olympics. First up was the semi-final, with Eoin first to go of the 15 qualifiers, having just squeaked in thanks the the massive error made by Scott Parsons of the USA in the qualifying round. Another five would be dropped after this round, but because the time would count towards the final score, the pressure was on. Eoin lost time at the beginning but clocked a respectable time of 88.85 seconds. So began the long wait; all we wanted was for five others to clock slower times. 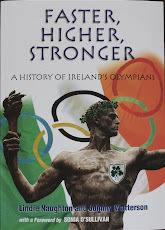 His training partner David Ford, aged 41 and competing at his fifth Olympics was marginally faster. So was the Belgian Bouton and the Aussie Draper; this was going to be tight. First to screw up was Campbell Walsh, who missed one gate and hit another; 95.74. Boukpeti of Togo (really France - but each country only has one place in this competition) had a stunning run of 86.05; where did this guy come out of? Raditch did us a favour by going slower, Eoin was still hanging in. Austria's Oblinger was marginally faster leaving Eoin sixth of ten, with five to go. When evetual champion Grimm of Germany clocked 87.31, Eoin was eight of 12, with thee to go, then tenth of 14, when Lefevre posted a time of 87.21. One to go and this was Kauzer who had set a course record of 82.o on his first run. "Ian Wiley told us that Kauzer could be mentally brittle. He didn't look it on the top section of the course, fast and clean. But then it all went wrong - his paddle hit a wall, and he seemed to lose his rhythm. Two touches on the final stretch; four penalties for a total of 89.42. Eoin was through. In the RTE Studio Ikey Jabobs was wondering whether his race number of 8 was bringing him good luck. An hour later, Eoin was again first off and again, on paper his time of 88.0 for a total of 176.91 didn't look enough, although he had paddled cleanly and strongly. But this is a sport where the tiniest of errors are severely punished. Obliger had a hit; Eoin was up to 10th. Then Italy's Molmenti totally lost it. He missed a gate and with another touch ended up on 230.90. Eoin was now assured of eighth place at least. Poland's Popiela never looked comfortable; time 179.68. Eoin now seventh or higher. David Ford had a touch; Eoin now sixth. When Bouten of Holland blew it missing a gate 227.99, Eoin was up to fifth. We were starting to dream of a medal although the big boys were yet to come. Next was Germany's Grimm. 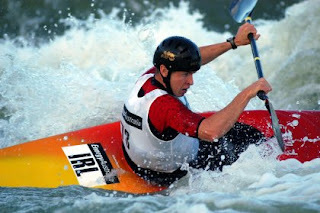 His run was an example of slalom canoeing at its best and most brilliant; speed, technique and perfect lines. Time of 171.70 - five seconds faster than Eoin - and surely enough for gold. When twice champion Lefevre clocked 173.30, only the bronze remained in question. Boukpeti from Togo set off. Would he blow it? When his time came up at 173.45, he had nailed a most unexpected bronze - but that's what happens at Olympic Games. Eoin can still take huge pride in his fourth place. Brilliant stuff - and what the Olympics is all about.